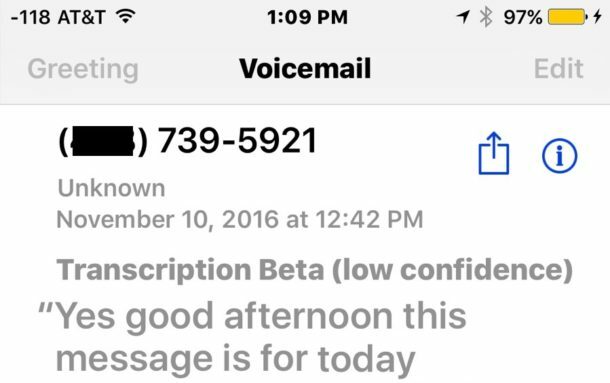 The iPhone now has an excellent ability to transcribe voicemails, offering users a transcription of whatever voicemail has been left on the device. The voicemail transcriptions feature happens automatically, listening to your voicemails and transcribing them into text automatically for you to read. The voicemail transcripts feature is fantastic and makes for an fast and efficient way to check your iPhone voicemail without having to actually listen to a message, making it more useful to send a call to voicemail, and easier to scan through voicemails to see if something is important, actionable, worth listening to, marking as read, or even responding to or not. Note that Voicemail Transcription for iPhone is currently in beta, and as a result it can be varying degrees of accurate or useful, but nonetheless it’s worth trying out. You’ll need an iPhone with a carrier that supports Visual Voicemail enabled, and you’ll need a modern version of iOS to have this feature. 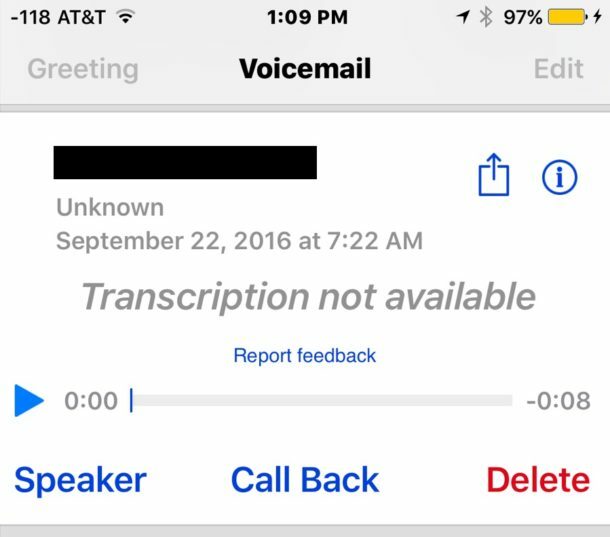 Anything beyond iOS 10.0 will support Voicemail Transcripts feature for iPhone assuming visual voicemail exists as well. At the bottom of the voicemail transcript you’ll see a light grey tiny font question asking “Was this transcription useful or not useful?” – you can tap on the little tiny micro blue text links to offer feedback to Apple on the feature. If the voicemail does not have a transcription available, the text will show “Transcription not available” rather than a transcription of text from the voicemail itself. You might see the transcription not available message if the voicemail was just left and hasn’t had time to be transcribed, if the transcription service is down, or if the voicemail is totally unrecognizable and impossible to turn into transcription text, a situation which can occur with low cell phone reception or generally nonsensical voicemails. There is currently no way to disable voicemail transcription, so if you don’t like the feature or you don’t use it, or find it to be inaccurate or unhelpful, or you don’t want the service listening and transcribing your voicemails, there is no way to opt out of the feature at the moment. If you delete a voicemail from the iPhone, the voicemail transcription will also be removed, however. 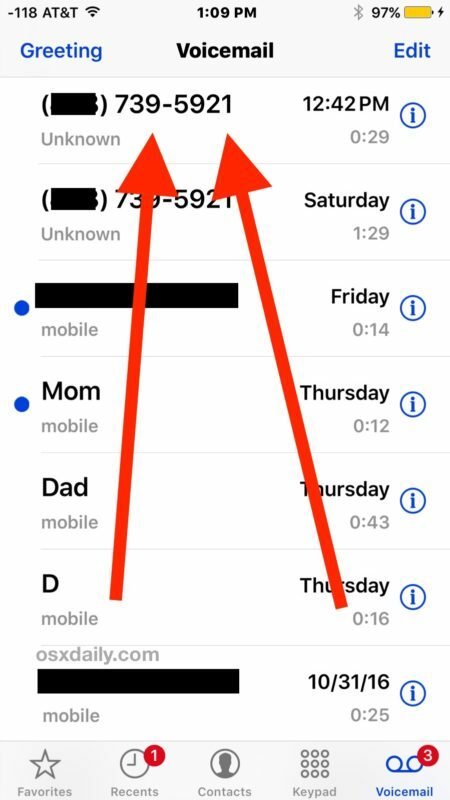 This is a great feature to pair with this trick to record iPhone calls by dialing voicemail, as it will transcribe your call recording (remember to get permission before recording any call, check your relevant laws, etc). Any transcribed voicemail can be saved or shared as usual, the transcription has no impact on the voicemail audio itself. You can also share the actual transcription text itself by copying the text the same way you would any other text in iOS with a tap and hold. 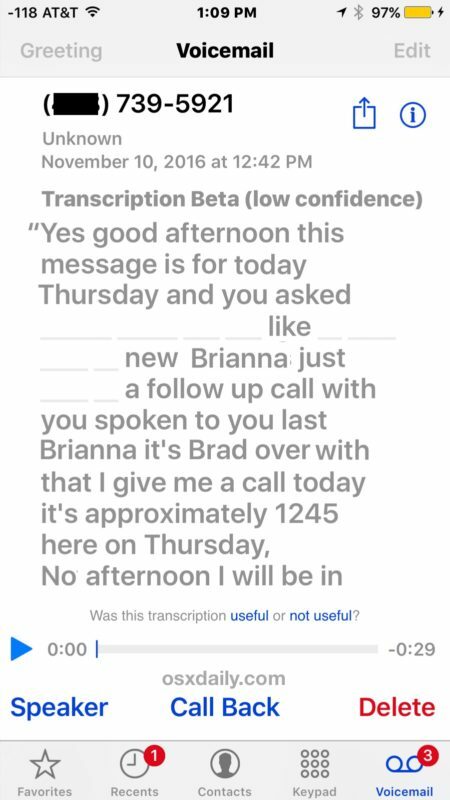 How do you like the new voicemail transcriptions feature? Let us know in the comments. Why is there no way to turn off voicemail transcription on iPhone? Isn’t there potential for privacy issues when the voicemails are being transcribed and you can’t turn them off? Who is seeing the messages and where are they stored? You also need an iPhone 6s or newer. This is a good point to make in the article – my wife’s 5C won’t do this at all while my 6S does, and it took a while to figure out that the 5C just doesn’t support it. I’m not sure why not since it does Dictation/Siri fine and presumably this is doing the same speech-to-text conversion, but it definitely doesn’t happen on her 5C. Good point, Voicemail Transcripts works great on my iPhone 7, but it does not work on my iPhone 2G original model and it’s also not working on my wired house landline! I think if the iPhone can support Siri, it can use this. But Apple holds off features to get you to update. My iPhone 7 is OK.
You started funny Egon, if snide. But you ended up just silly. The more likely reason is that it is easier to control a beta test by restricting a service in development to a level of phone known to have a certain level of processor speed. Works great for me but transcripts are sometimes way off. Is this a US thing or a younger beta iOA? I believe that the first thing that should be written is what iPhone models this is on. My fairly new iPhone 6 doesn’t have this functionality. In fact it has no voicemail other than what my service provider has for me and it’s voicemail isn’t on the device. So I’m not sure if this feature will even work with Rogers service regardless of the iPhone. One way or another, this is using data, albeit a very tiny amount per msg. I suppose if you get hundreds of vms/month it could add up… Hard to imagine it won’t be optional, after beta. Not here, and my iPhone 6’s system is up to date. The iPhone user guide for iOS 10.1 does not say anything about earlier models not working with this feature. Maybe it will work on earlier models when it goes out of beta, but it sure doesn’t now. So, I’m a lawyer and any communications with my client are privileged from snooping eyes. This transcription is a gross violation of the privacy between me and my clients. And as anyone knows, once something is in “writing” i.e., transcribed, it is subject to subpoena from any source (whether law enforcement, the fed, or in a civil lawsuit). At that point, instead of being in an argument about whether or not the transcript/communication should be subject to a subpoena/subpoenaed, now the lawyer is in an argument about the content of the transcript. That’s one major and serious objection I have to this being forced onto my phone. The second is that the transcription is grossly inaccurate, from the few times I’ve looked at it. “Hey it’s me” becomes “Siri …” etc. God forbid the transcript gets subpoenaed, *now* the lawyer is in an argument about the freakin **contents** of the transcript, and the client is in the position of having to verify or correct the transcript before or after it is used against him. “I didn’t run that red light” can easily become “I runned that red light”. Now instead of testifying as to what happened during the accident, the client is in the position of “making excuses” or “correcting” the “official” transcript of the recording. This is bad, I’m actually amazed Apple’s lawyers let this pass. I agree I think it is very odd that there is no way to disable the transcripts on iPhone. This could also pose theoretical HIPAA privacy issues. Mine are about 60% accurate but as you say, some words that show up are just the opposite, and the general accuracy is low enough to not be reliable but to certainly be problematic. but why would you be leaving sensitive legal information on a voicemail…?